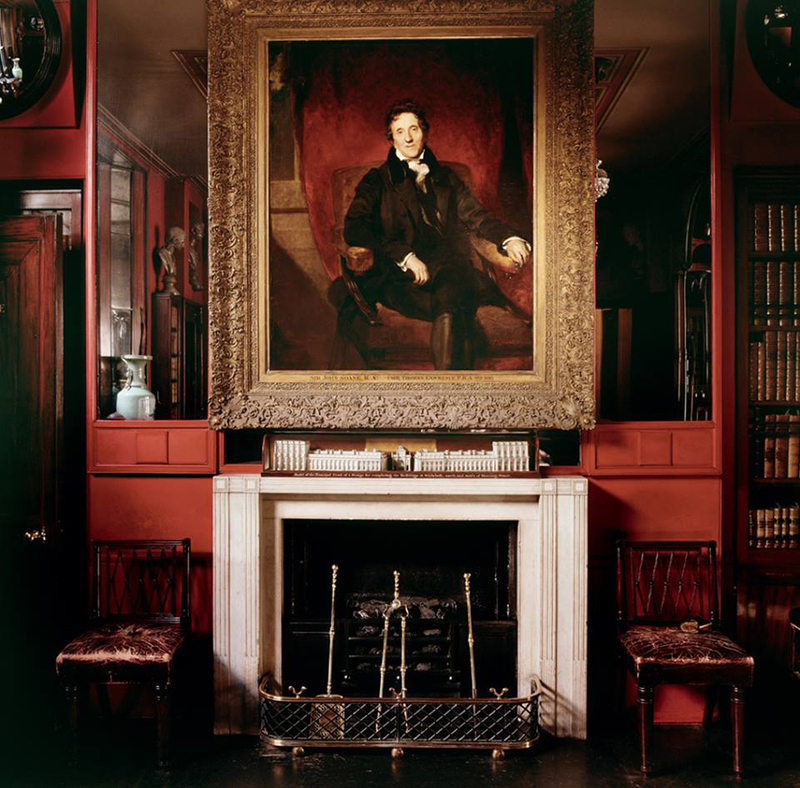 Sir John Soanes’s Museum, London, has mounted a crowdfunding campaign with the aim of raising £15,000 to restore one of the frames in its care. This belongs to a painting – The snake in the grass – which was particularly significant to Soane because of his personal connection with the artist, Sir Joshua Reynolds. However, its NeoClassical-style frame has suffered the effects of the last two centuries, particularly in its finish, and urgently needs to be cleaned and conserved. By donating to the fund, you can make a difference to the presentation of this work. 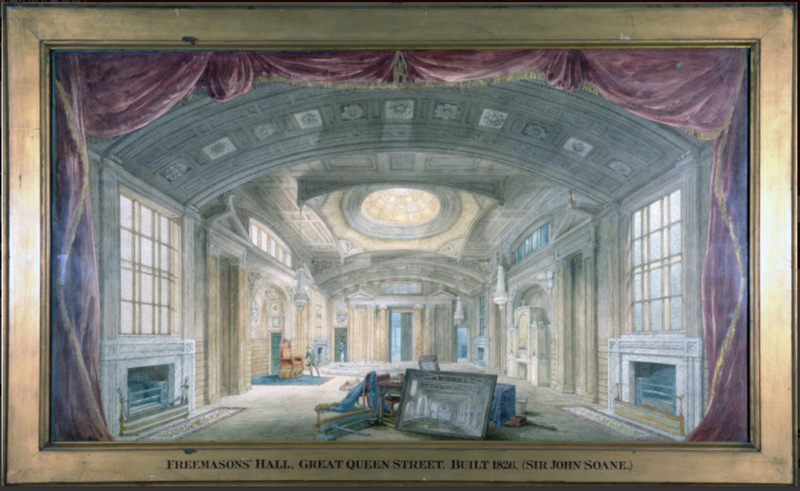 John Soane was born in 1753 near Reading in Berkshire, the son of a stonemason and builder, and in 1769 began his career with the architect George Dance. He started attending the Royal Academy schools in 1771, and a year later was awarded the RA silver medal for architecture; he also moved to the office of Henry Holland, who was only eight years his senior and was working on his first major commission, Claremont House in Surrey, for Clive of India. 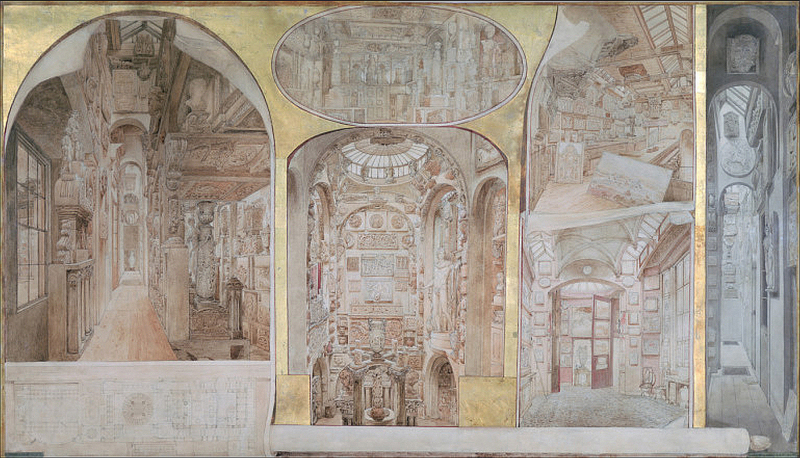 This all seems to have been immensely fertile ground to nourish Soane’s career: by 1776, at the age of 23, he had been awarded the RA golden medal, which was presented to him by Sir Joshua Reynolds – perhaps explaining the importance of his later owning a painting by Reynolds. He was given a scholarship along with the medal and spent three years in Italy, saturating himself in the physical remains of the classical past. He visited sites such as the Villa Negroni, which was currently being excavated; he later acquired a series of engravings of frescoed walls in the villa, made after drawings by Anton Mengs, which he hung in the breakfast room of the house which would eventually become the Soane Museum. Returning to England in 1780, he took several years to establish his career, eventually being appointed architect to the Bank of England from 1788, and working on it until 1833. He had many other appointments and many commissions, but few of his projects have, unfortunately, survived: even the Bank being destroyed in the 1920s. His major surviving projects are probably the Dulwich Picture Gallery (finished 1817) and his own house in Lincoln’s Inn Fields. Both shared with the Bank of England a minimal and concentrated classicizing style, built of flattened domes and round arches, which formed the containers for interiors modelled from a complex interplay of light and shade . Every room he designed seems to have included vistas into other rooms, through internal windows, onto staircases, or through mirrored reflections in opposed looking-glasses. In a sense, all his interiors are a series of huge frames set at angles to each other and opening onto fragments of enfilades where the slant of light suggests further corridors, halls and ascents. Dulwich Picture Gallery is perhaps the perfect public expression of this novel and inventive remaking of classical architecture, since – apart from the configuration of the building itself – it is hung with paintings which open their own receding vistas in the walls, and their frames create similar perspectives of oblong and rhomboid panels to the looking-glasses and openings in Soane’s house. This house was built in stages from 1792, out of a trio of houses in Lincoln’s Inn Fields; first no 12, then in 1807 no 13, and finally, in 1823, no 14. 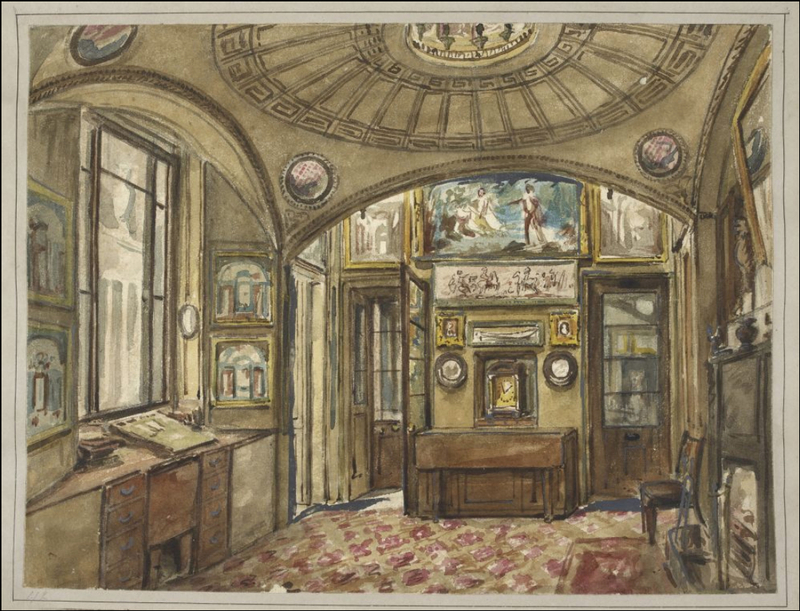 It was his home, his working office and the museum for his vast and diverse collection of paintings, drawings, prints, books, casts, and antique objects. 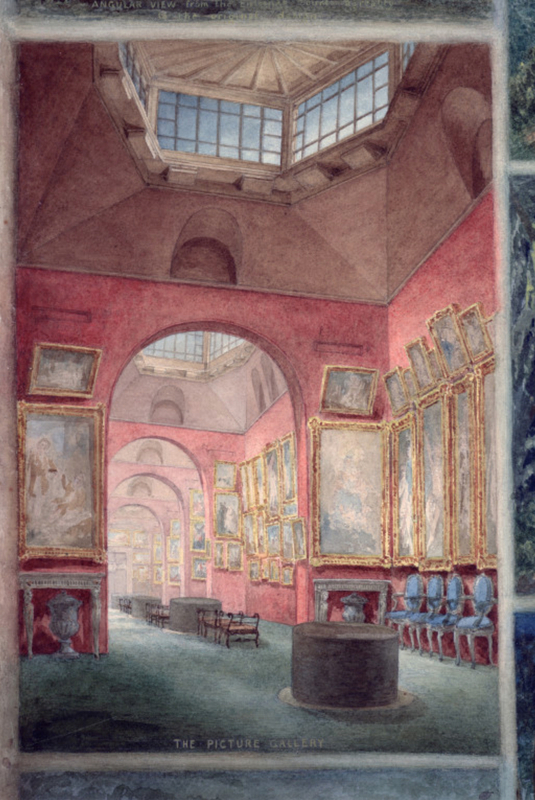 The architectural drawings – elevations, plans and details – in the collection include a large group of the buildings commissioned from Soane’s office; these were frequently shown at the Royal Academy: in fact, Soane exhibited his architectural work there for a total of nearly sixty years. 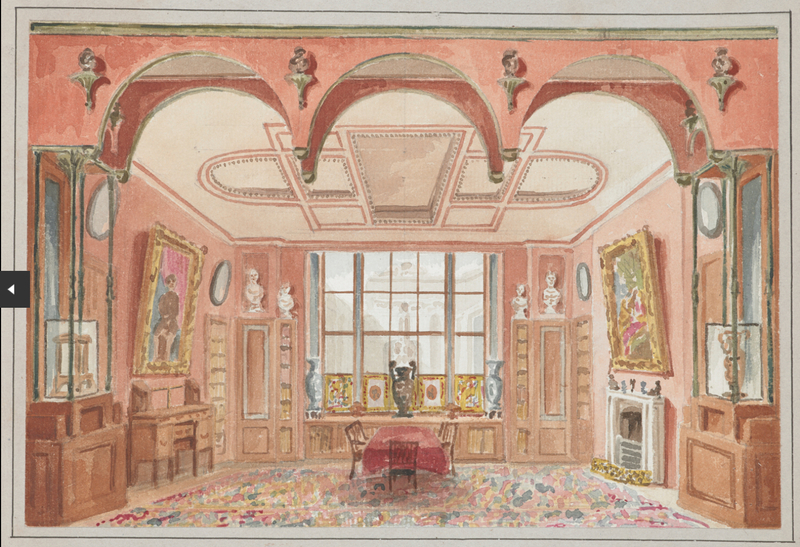 These drawings, beautifully interpreted in watercolour by assistants such as Joseph Gandy and Henry Seward, were framed in very simple architrave or hollow NeoClassical frames, sometimes with minimal lines of ornament (a couple of reeds or some beading). 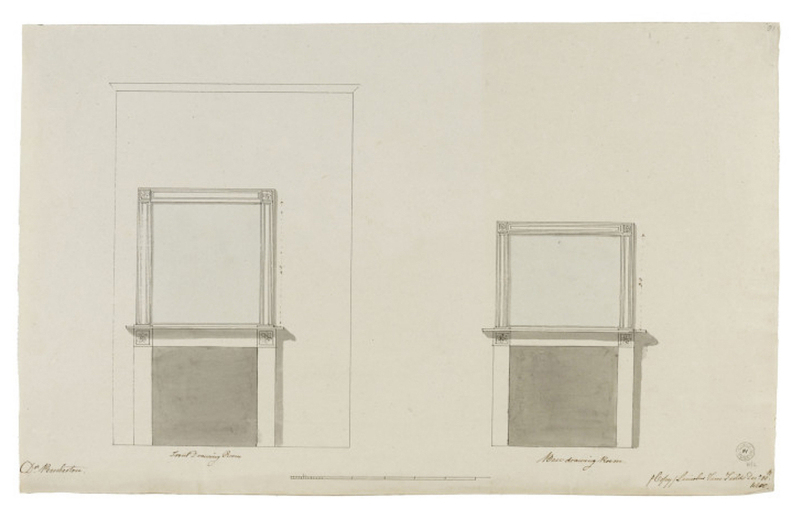 These are related, partly to the flat studio frames employed by many artists – especially in the 19th century – for sketches and studies that they retained, and partly to larger, more formal designs by Soane for chimneypieces and overmantels. 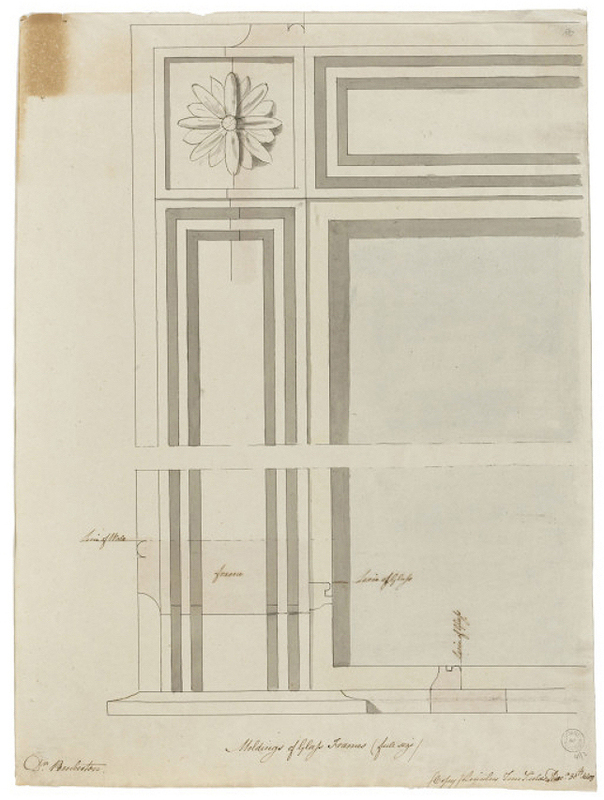 Drawings such as the two above are characteristic of his avant-garde approach to classical structures and mouldings, and express a radical step forward from the earliest goût-grec of NeoClassicism, and from its later delicate and ornamental treatment by the Adam brothers. 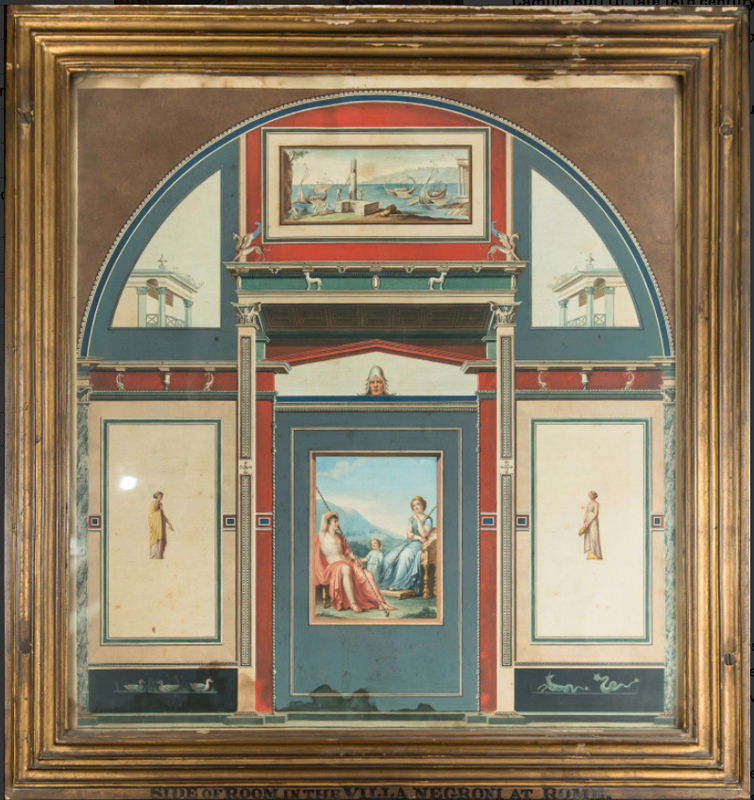 The frames Soane used to display the architectural watercolours and capriccios he acquired by other artists were related patterns; all NeoClassical in style, but restrained, linear, and generally reflecting something of the subject. The design used on the Clérisseau, above, is probably the richest of this genre of frames, with bound fasces at the top edge, a small knulled moulding and rais-de-coeur. This use of relatively plain mouldings, with profiles which varied within a certain type and usually only one or two orders of decoration, enabled an harmonious hang in a small space with enough variety to prevent the wall (or shutter) from looking too uniform. 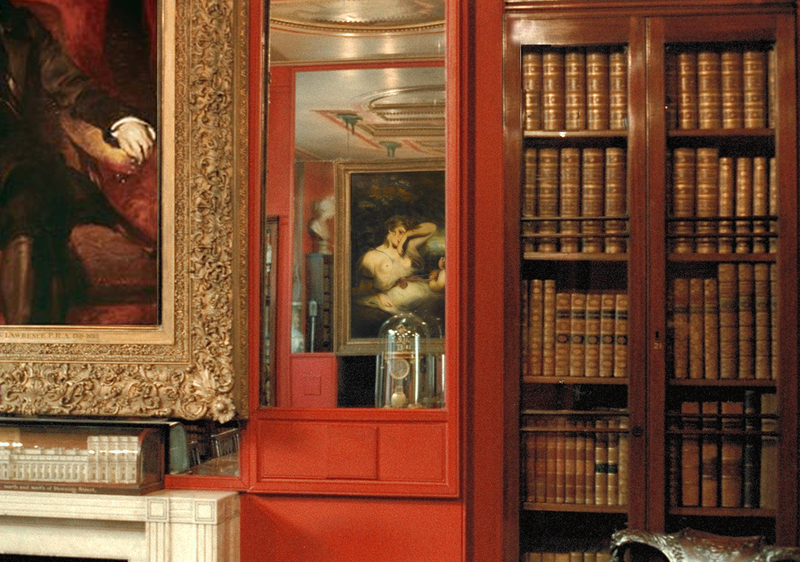 However, when he bought important or significant works, he seems almost always to have retained the frames they arrived in; possibly because, being more or less contemporary – or at least coaeval at some point with Soane himself – they fitted into an interior which was already noticeably eclectic. 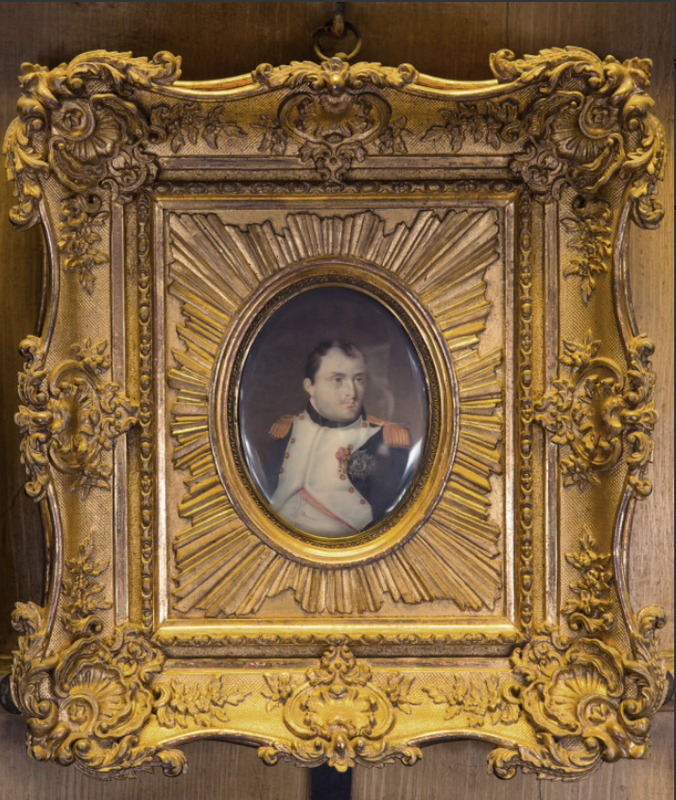 For example, the extraordinary miniature Louis XV style frames, with sunburst spandrels, framing two small portraits of Napoleon, scarcely shout their presence when seen through the hanging dome of the Breakfast Room, as part of an extremely varied arrangement of paintings between and over the doors. They can be seen not only in the black-&-white plate from Soane’s description of his house, higher up this article, but in the colour plate from the same work, and in an image from the Illustrated London News of thirty years later. 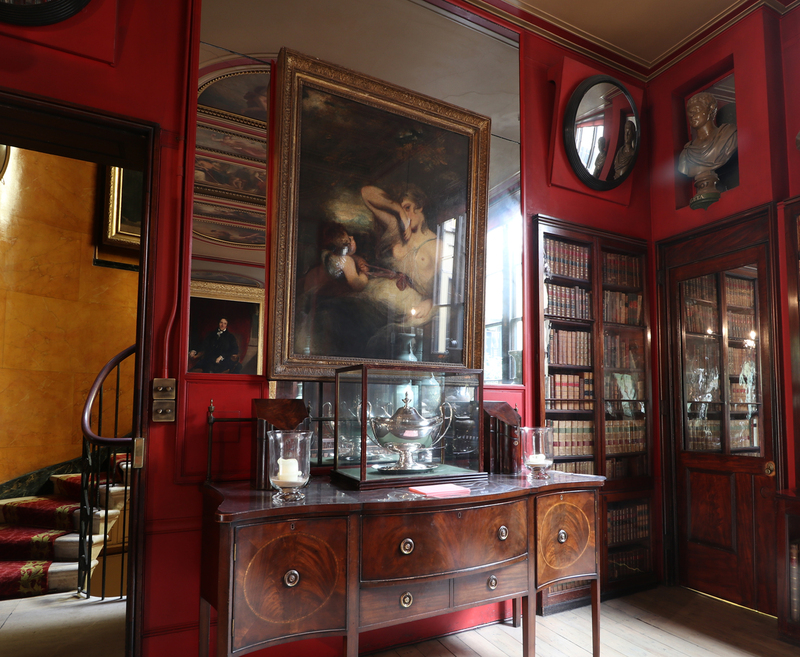 Soane also kept the frames of the two large Turners he purchased. The elaborate Louis XV-style frame on Admiral Van Tromp’s barge entering the Texel is almost unarguably the original choice of the artist, possibly chosen to underline, in its opulent and costly way, that this was an important painting; possibly to echo visually the billowing sails and curveting waves. 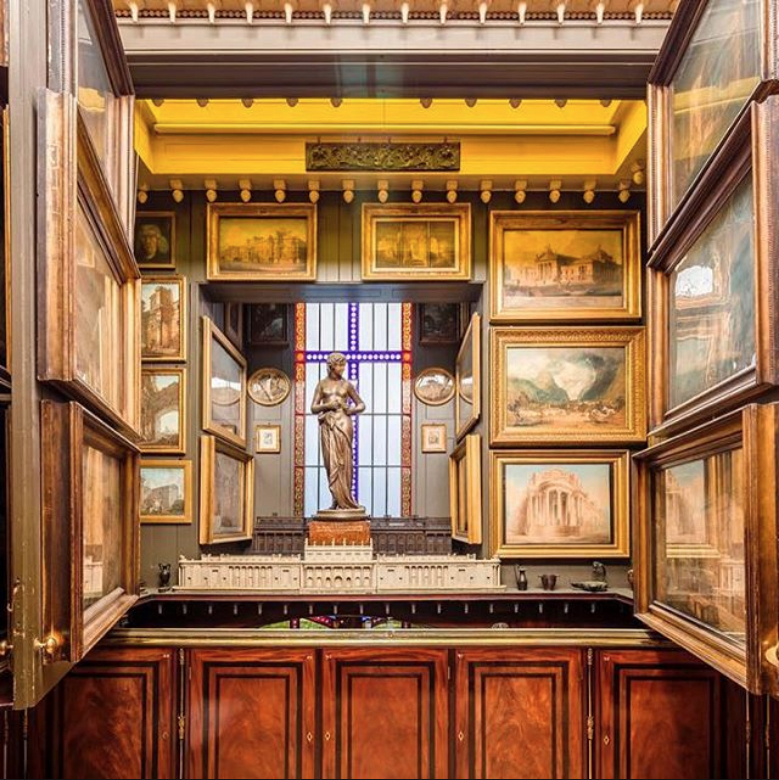 Admiral Van Tromp’s barge… was exhibited at the Royal Academy, where Soane bought it for 250 guineas (£262.50) – a price which would traditionally have included the ornate frame – and there is no record in Soane’s archives of its ever having been subsequently reframed. 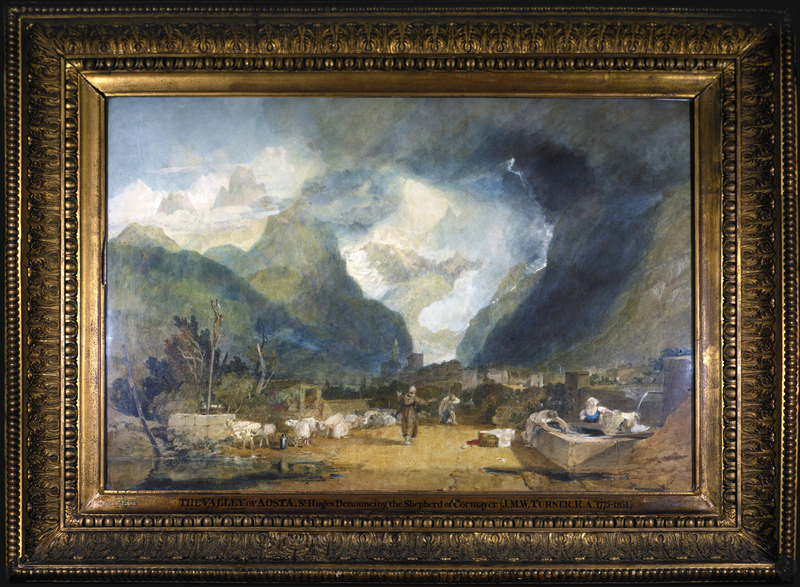 He – or, rather, his wife – also bought the Val d’Aosta from Turner’s Gallery, for the far smaller price (since it’s a large watercolour, rather than an oil painting) of 50 guineas or £52.50. The only archival reference to it in the Museum notes its escape in the 1880s from a recommendation to provide it with a mount ‘of at least four inches in width’, and a new frame . As well as retaining its original close frame it has also been protected from light. The resultant survival of intensity in the colour of the paints demonstrates why Turner chose – as many of his peers did – to frame his watercolours like his oil paintings, unmounted, in heavy golden borders. 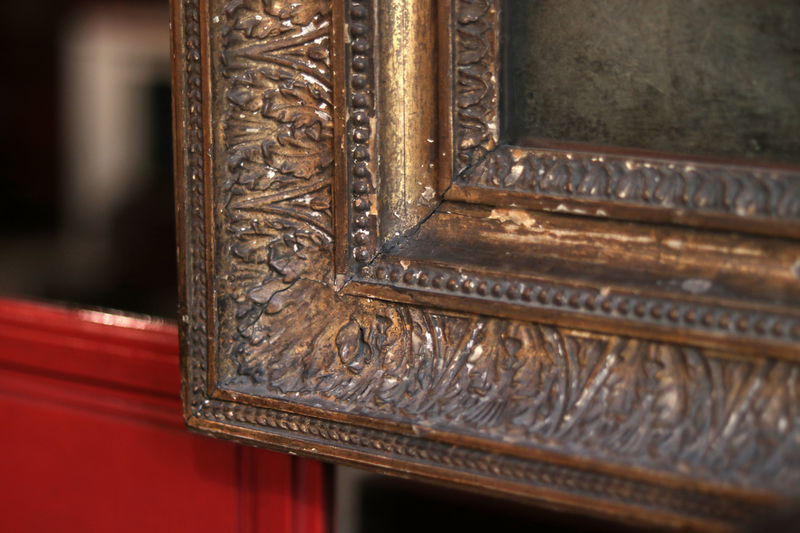 The frame on the Val d’Aosta is particularly wide and opulent, compared with contemporary or earlier examples of 18th century close frames. 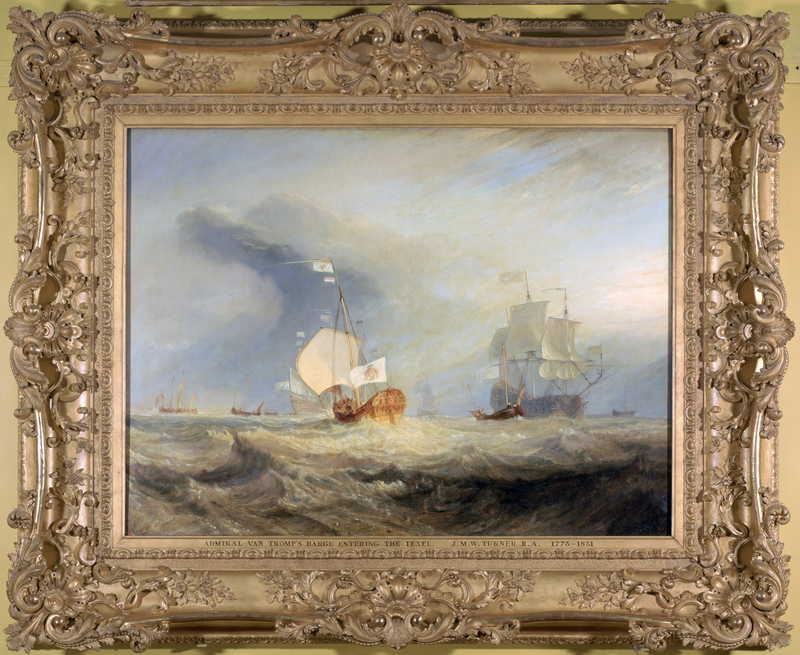 The frame on this second Turner is interestingly close in style and profile to the frame of Reynolds’s The snake in the grass, with which this article is particularly concerned. 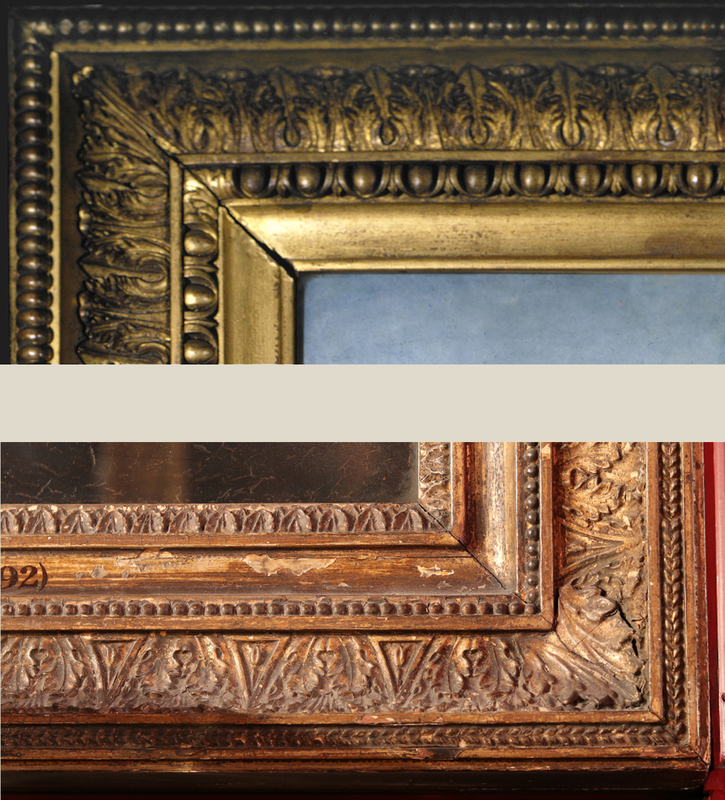 As can be seen from corner details of the frames, both are hollow or scotia frames with a subsidiary cavetto near the sight edge; both have a decorated flat top edge, and the major ornament in both is the acanthus hollow – in Turner’s frame, an acanthus-&-leaf; in the Reynolds, an acanthus-&-dart, enriched with a leaf bud. Reynolds’s painting is one of three with the same subject and similar compositions, which were executed within a few years of each other in the 1780s. The first was A nymph and Cupid: ‘The snake in the grass’, exh. Royal Academy 1784, Tate; the second the work which Soane eventually bought; and the third, Cupid untying the zone of Venus, was commissioned in 1788 by the Earl of Carysfort (who had also commissioned the first version for himself) on behalf of a member of the Russian imperial family. They are all three almost identical in size. 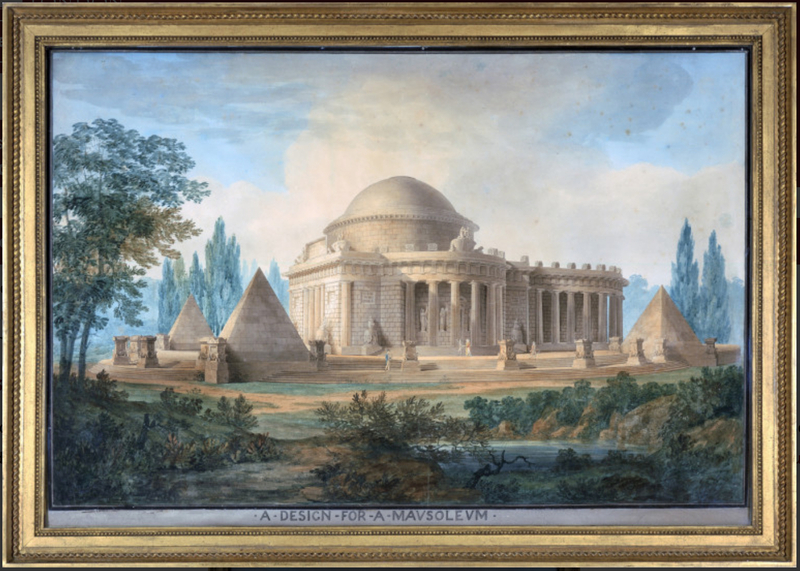 The version that Soane acquired had been inherited directly from Reynolds by his niece and main heir, Mary Palmer, who married an Irish peer six months after her uncle’s death in 1792, becoming Marchioness of Thomond. 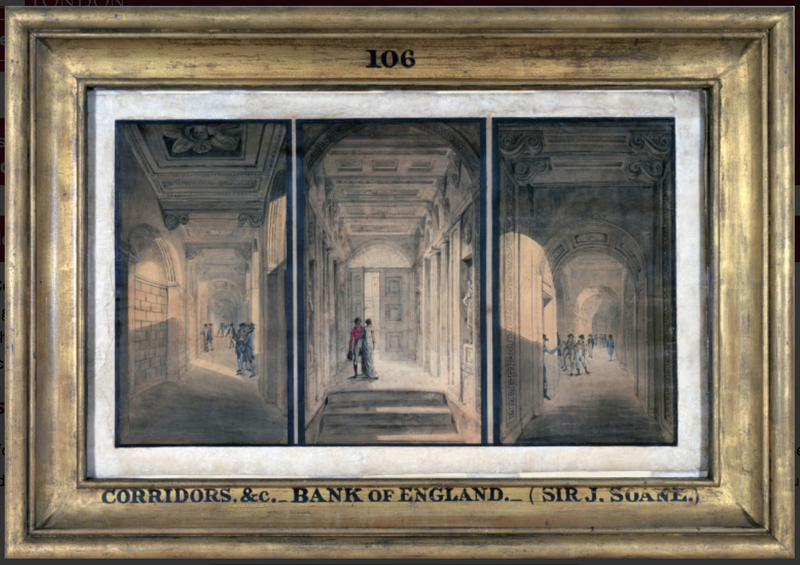 In 1820 she too died, and Soane bought the painting at her posthumous sale for 510 guineas (£535.10.00). Reynolds may not have framed it at all while it remained in his studio; if he had he might have used the ‘Carlo Maratta’ frame he favoured in the 1760s and 70s, and a late example of which frames his self-portrait (c.1780) in the Royal Academy; however, there is no indication as to whether (and if so, how) the painting was framed when his niece inherited it. The frame which is on it now is not the narrow 18th century NeoClassical style also favoured by Reynolds, but the wider Regency pattern, dating from the first quarter of the 19th century; and the most probable moment for its having been framed like this is after the death of the Marquess of Thomond in 1808. His wife lived with him at Taplow Court near Maidenhead, but would have had to leave this house to his heir; she seems to have moved to Baylis Court in Stoke Poges, where she died, and may well have reframed some of the collection of paintings she took with her at that time. 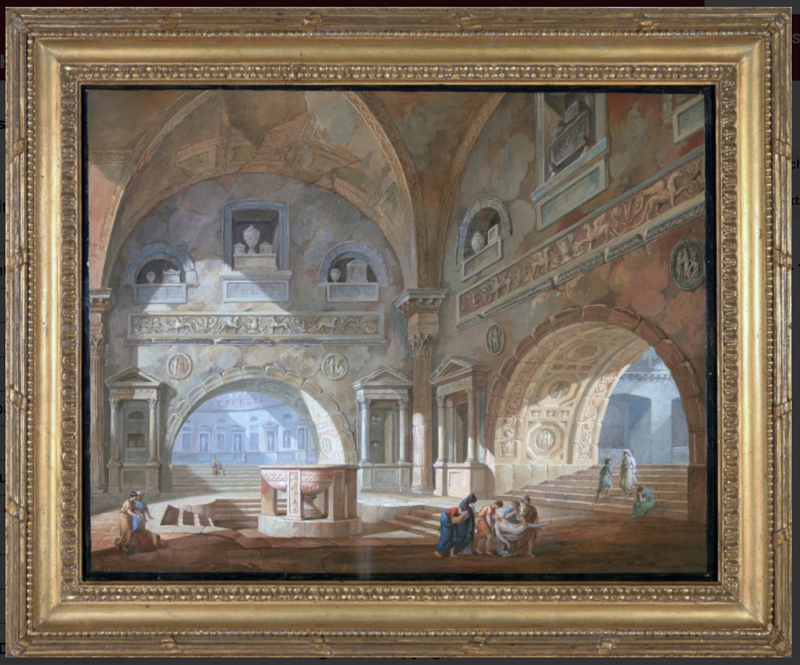 When Soane bought the painting, therefore, the frame may have been relatively new and in good condition. The value he put on the painting, as a striking composition by an artist he had admired for a long time, is underlined by the fact that in the final hang he arranged in his library dining-room, he placed it opposite his own portrait by Lawrence (in a ‘Lawrence’ frame). Both works are hung over looking-glasses, so that – as the spectator moves in front of one of them – the other floats behind it, in the distance. The 19th century was the era of mechanization and the growth of industrial processes; these affected the production of frames just as much as of metal or textiles. Profiles were cut by mechanical saws, and decoration was applied in the form of composition (or compo), shaped in carved reverse boxwood moulds (like blancmange), and glued when dry to the wooden carcass. 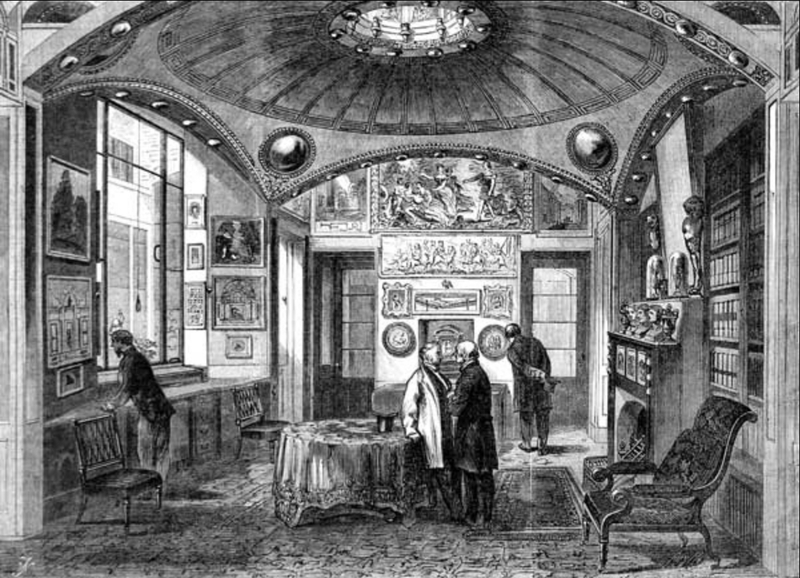 In the second half of the 18th century Robert Adam had used compo to a wider extent than before in Britain, finding that the trailing festoons of husks he added to looking-glass frames, and bands of the more delicate NeoClassical ornament, could be produced much more easily and cheaply than by other methods; but the use he made of it was very minimal compared with the mushrooming increase in compo frames from the turn of the 19th century. Lawrence’s frames, with their very wide rails and small, low relief calligraphic ornament, could only be made economically by using compo rather than being carved laboriously by hand, and 19th century frames in general tended to grow wider and deeper than their predecessors, because these new processes and material allowed them to. Unfortunately compo, which is made from a mixture of resin, linseed oil, size and whiting, never dries completely before use. It continues to dry and harden whilst in place, eventually shrinking and pulling away from the substrate, cracking and flaking in the process. British frames also tended to be oil-gilded, rather than water-gilded in the Continental fashion; here the gold leaf floats on a layer of size, which also takes a very long time to dry out, and whilst it dries it attracts dirt and soot. 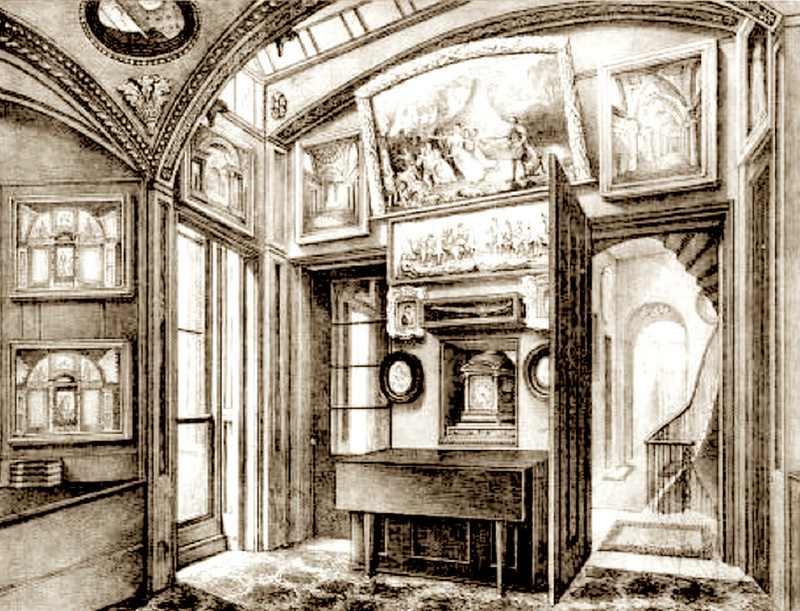 The result, for a frame decorated in compo, finished with oil gilding, and hung in a smoggy London house heated with coal fires and lighted by candles, oil lamps, and gas, can be seen above. The frame of The snake in the grass has all but lost its golden finish, and the compo ornament is cracking and lifting. The ‘Lawrence’ frame on the portrait of Soane has already been conserved; now it’s the turn of the Reynolds. You can help restore this frame by donating to the crowdfunding campaign in the Art Happens section of the Art Fund website. £15,000 must be found; please help to give the nymph and her Cupid their lost golden setting. 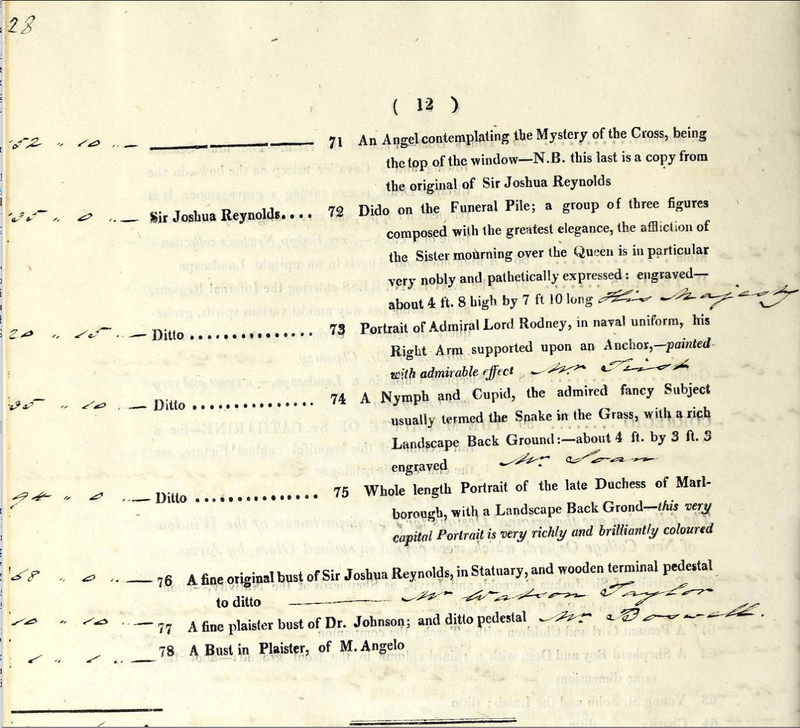 Sir John Soane’s Museum, Trustees Minute Book, 2 February 1883; information from Helen Dorey. 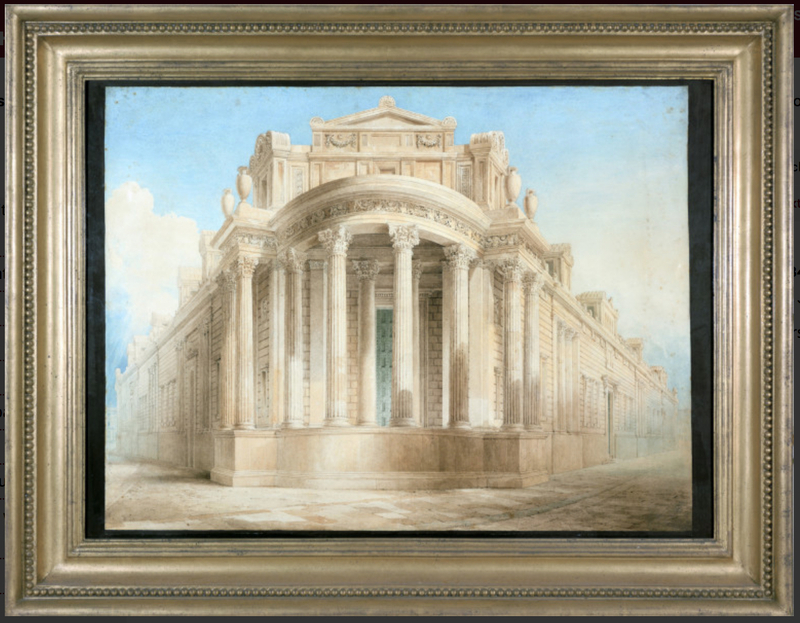 The website entry for the Val d’Aosta notes that a watercolour of Soane’s design for his wife’s tomb has an identical frame; however, this need not invalidate the fact of the Turner retaining its original frame, since it is very probable that Soane may have used Turner’s framemaker, given that they were friends, and that Soane – for instance – helped Turner with the arrangement of light-diffusing hangings in his Gallery.